If you’ve ever been to the Westport Weston Family Y, last week’s photo challenge was a slam dunk. Ben Berkley, Lynn Wilson, Elizabeth Fry, Ann Bernier, Jalna Jaeger, Karen Kim, Art Schoeller, Martin Gitlin, Rick Benson, Kathy Fagan and Eva Lopez Reyman all recognized the cow. They should. It’s been there since the new Y opened. Where did it come from? Who decided to put a cow on the roof? In other words, Why, Y? If you know the back story, click “Comments” below. And if you know where to find this week’s photo challenge, do the same. This entry was posted in Photo Challenge, YMCA and tagged Westport Weston Family Y. Bookmark the permalink. Boat slip – Ariel view – Ned dimes marina ? The Dimes Marina from overhead. The marina taken from a drone. Wow. I thought this one would be VERY hard. You guys are GOOD! Yes, it’s the Ned Dimes Marina at Compo Beach, taken by a drone. Well done! 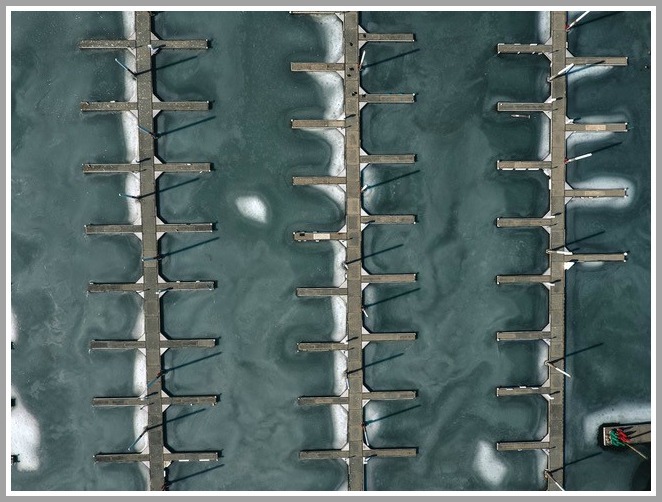 Compo Yacht Basin, ( ah er Ned Dimes Marina) aerial view of empty slips in winter!! A nice pic of Ned Dimes marina from the air. Yes the marina at Compo beach, but I want to know the back story about the cow, no one commented on that! Yes, Rick Benson did. He said it came from Lucy McKinney’s collection of fiberglass animals. She and her family — the Bedfords — are longtime benefactors of the Westport Y.